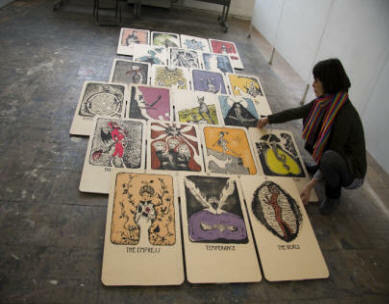 Beatriz Inglessis offers a set of videos on her website showing her set of major arcana posters that are the original scale of her Japanese woodblock print project, “The Way of the Fool.” The videos give you an idea about the set of 22 posters and also a scroll rollup version of the prints. My review here is of a set of small cards produced for reading. This set of cards of the vastly reduced images is about the size of a calling card, which is about 1/3 larger than a business card. These 23 cards [the extra card names deck, artist and has signature] are delivered in a nice cloth flap bag. Most of the images can be seen on her website videos. As visual interpretation of the Major Arcana, her approach offers straightforward depictions of essential attributes of a tarot image with iconic directness, a reticent use of color, and a dynamic sense of space and motion. By far the sense of energetic motion of the images is to my eye the most appealing aspect of these cards for a tarot reading. Even in this small deck each of the classic images suggests a sense of vitality. I believe Inglessis achieves this pleasing effect through restraint of space shape blotches that deflects the eye to the surrounding intervals, a dance of continuities and interruptions. 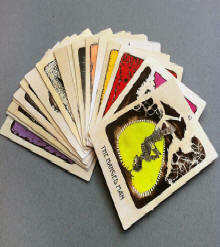 It is remarkable that this little set of tarot majors retains the vigor of the poster size images. This is a deck I will reserve for comfy candle-lit, wine-sharing, an intimate moment for two to query the oracle. For personal tarot readings contact me by phone or email to schedule appointment. Copyright © 2002-2018 Wordtrade.com. All Rights Reserved.